Dryness in feet is often accompanied with cracked feet. An individual may feel some pain due to dryness and cracks in feet. The problem of dry and cracked feet may occur any time during the year; though it is a common problem during winters. If proper care is not taken, the feet may get extremely dry. It is very important to take appropriate action as soon as you start observing your feet getting dry. This would cure the problem soon and help in attaining soft and smooth feet. There are various dry feet remedies which can be of tremendous help in getting rid of dryness from the feet. You can opt for several creams and lotions that are available at the nearby drug store to deal with the problem of dry and cracked feet. 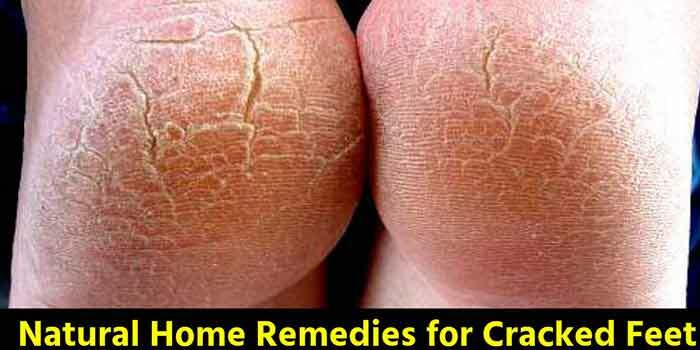 However, the best way to treat cracked and dry feet is through natural remedies. Natural remedies are quite safe and help in getting rid of dryness from the feet in an effective manner. Soaking the feet in vinegar mixture is one of the best natural remedies for dry feet. A mixture of warm water, little amount of soap, and white vinegar should be made and the feet should be soaked in this mix for a few minutes to get rid of feet dryness. Soaking the feet in a mix of water and baking soda is a good remedy for dry feet. This remedy can be used to treat dryness from all other areas of the body too. You can soak the entire body in baking soda bath for a few minutes to get rid of skin dryness. Milk is enriched with natural moisturizing properties which help in softening the feet in a wonderful way. A mix of warm water and milk should be made and the feet should be soaked in this solution to soften the hard skin and attain soft and smooth skin. Banana helps naturally in dealing with dry and cracked feet. Mashed banana should be applied on the feet and removed after around fifteen minutes to obtain smooth feet. This remedy should be followed regularly for around a week to see immense improvement in the condition of feet. Rubbing vegetable oil on dry feet is one of the ancient dry feet remedies. The oil can be used on other skin areas also to get rid of dryness. The above discussed natural remedies would help in improving the beauty and softness of the feet, while getting rid of the dryness. It is always better to take some precautionary measures in advance as far as possible, so that the feet do not get dry. Massaging the feet with some moisturizing oil like olive oil or vitamin E oil every day is one of the best ways to keep the feet soft and smooth. Applying some moisturizing cream every night before going to bed is also a good way to keep feet dryness at bay.